A blue Toyota Prius was caught on video travelling fast and recklessly overtaking vehicles from the left along the Kranji Expressway on Saturday (Nov 17). The driver of the same car was arrested for dangerous driving almost two years ago in January 2017. In the latest video that was posted on ROADS.sg's Facebook page, the driver is seen displaying similar behaviour to the previously recorded incidents. He comes in fast from behind before overtaking from the left without indicating. Serial reckless driving has no place on our roads. Stomp previously reported the driver of SKU4774H was arrested for dangerous driving on Jan 23, 2017, three days after he was caught on video cutting across lanes along the Pan Island Expressway (PIE). The Blue Prius C, SKU4774H, strikes again. Stomp carried a report on that clip, highlighting the similarities it bore to a similar incident in October 2016. The driver of the blue Toyota Prius was also seen driving to the Traffic Police Headquarters on Jan 23. According to the ROADS.sg post, a police report will be made against the driver regarding this latest incident. 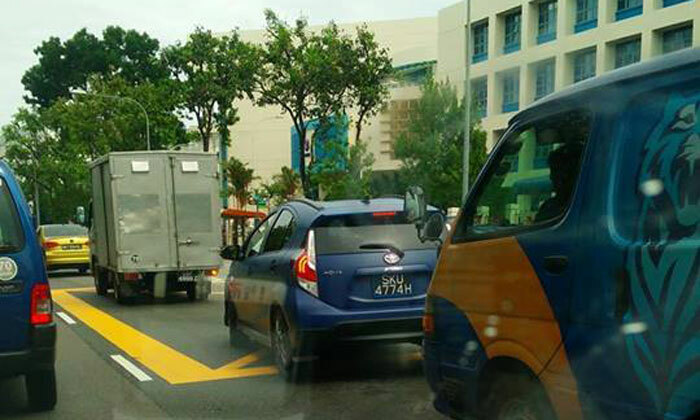 Get this crazy driver of blue Toyota Prius SKU4774H off the road, please!